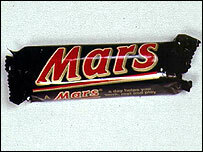 Shop staff were left bemused after a woman bought 10,656 Mars bars. She made the huge purchase in Woolworths on Edgware Road, central London, last Tuesday. The woman asked for all the Mars bars they had - including ones in the stock room and paid the £2,131 with new £50 notes. A spokesman for Woolworths said: "We have no idea what she wanted that many Mars bars for but it raises all sorts of questions." She then left it to a chauffeur she had with her to load the 200 boxes of chocolate into the back of a waiting car. Daniel Himsworth, a spokesman for Woolworths, said: "The manager of the store said she looked Lebanese. She was smartly turned out in traditional black robe and a head- dress. "I can certainly say we have never had that many Mars bars bought at the same time in the same store before."